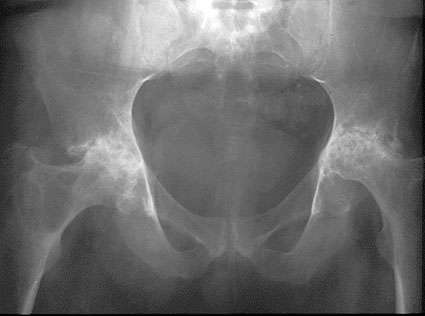 This is an image of advanced RA in the hips. At first glance, the plain film resembles OA but note the joints are narrowed symetrically unlike OA. There exists, however, some subchondral sclerosis due to intervening secondary OA. The hips look like they will migrate right into the middle of the pelvis this is called protrusio acetabulae.